As hockey continues to grow in popularity, so too does the number of adults that refuse to hang up the skates. It’s been very interesting to see how many adult players not only like to keep playing, but will reach out to me to see what they can be doing to help be in better “hockey shape” for their games. 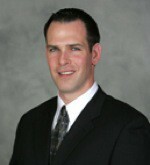 As with younger players, some are interested in improving their performance. Others simply want to avoid nagging injuries or do enough to not be so sore after they play. Naturally, those with full time jobs (and possibly kids) don’t usually have as much time or energy to dedicate to the training process. 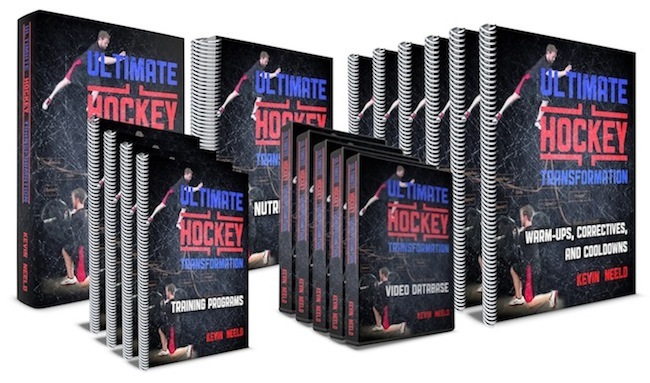 The warm-ups within Ultimate Hockey Transformation are comprehensive. They are meant to fully prepare your body to perform at your best. At first, they may seem a bit daunting and time consuming, but once you get into a routine they’re much quicker. This is one reason why spending a week just going through the foam rolling, mobility work, and dynamic warm-up will benefit you. It will let master the process so it only takes ~10 minutes instead of 20-30. For some, this will also feel like a workout in itself. By doing it everyday for a week (or most days of the week for a couple weeks) you’ll build up a foundation of fitness for you to progress on from in the future. Lastly, getting a lot of practice with these things will help you feel which exercises really cater to your specific needs. I realize you’re probably not going to go through a full warm-up before every adult league game, but mixing in a few of the most beneficial mobility exercises before you hop on the ice can go a long way in maintaining your flexibility over time and preparing you to play better on the ice. Every adult is a little different, but as a general rule, I wouldn’t recommend adult players jumping into programs that have Olympic lifting variations and other complex movements. If you’ve been out of training for a while, the first step is to get back to mastering the basic movements. This is the same goal we have for our younger athletes. It’s important to get very good at the basics before progressing to more difficult exercises. The programs at this age also have less of a time commitment, so you won’t feel like you’re falling behind if you can’t train 4 times per week. As a result, the U-14 programs are a perfect starting place for most adults. Depending on the phase, sometimes an exercise may have anywhere from 2-5 sets. More sets not only means a longer day in the gym, it means more stress to the body. If you’re working all day, and trying to squeeze in a quick lift before running home to eat dinner with your family and then heading out to play a game, you may not have the time or the “stress reserve” to do the full program. Shaving off a few sets so you’re only doing 2-3 sets of all the main exercises and 1-2 sets of all the supporting exercises is a great way to adjust the program to fit your needs better. All of the in-season programs are designed to train 2 days per week with relatively few exercises, sets and reps. While our players continue to develop strength and power during this time, the reality is that the focus during the season is on maximizing on-ice performance so the total volume of training needs to be cut back a bit to account for the increase in on-ice work. For the reasons mentioned above, sticking to these programs (or at least starting here) will be a great option for most adult players. When I talk to the players on our youth teams about their nutrition, I’ll tell them, “Some of you have terrible eating habits. The rest of you are even worse.” And we all laugh. The reality is, most adults aren’t much better. There is some research that connects BCAAs (protein) to decreased soreness. I strongly believe dehydrated muscle tissue is more likely to tear (or “tweak) than hydrated tissue. Carrying around extra body fat isn’t good for anything. 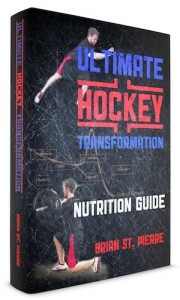 Brian St. Pierre did an incredible job delivering a TON of easy to implement strategies to help you improve your nutrition, which ultimately will help you improve your body composition, perform better, and recover faster. This information, and the habits you develop following it, will benefit you and your family for the rest of your lives, on and off the ice!